Rahmani, D., Hajipour, M., Safaie, N. (2018). A heuristic light robust approach to increase the quality of robust solutions. 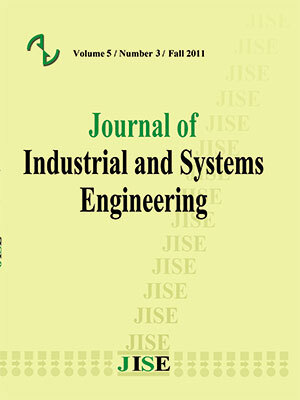 Journal of Industrial and Systems Engineering, 11(1), 258-269. Donya Rahmani; Morteza Hajipour; Naser Safaie. "A heuristic light robust approach to increase the quality of robust solutions". Journal of Industrial and Systems Engineering, 11, 1, 2018, 258-269. Rahmani, D., Hajipour, M., Safaie, N. (2018). 'A heuristic light robust approach to increase the quality of robust solutions', Journal of Industrial and Systems Engineering, 11(1), pp. 258-269. Rahmani, D., Hajipour, M., Safaie, N. A heuristic light robust approach to increase the quality of robust solutions. Journal of Industrial and Systems Engineering, 2018; 11(1): 258-269. In this paper, the optimizations problems to seek robust solutions under uncertainty are considered. The light robust approach is one of the strong and new methods to achieve robust solutions under conditions of uncertainty. In this paper, we tried to improve the quality of the solutions obtained from the Light Robust method by introducing a revised approach. Considering the problem concerned, an algorithm was also developed to properly choose the weight parameter in the proposed approach presented as much as possible. In addition, the data obtained from the proposed approach were investigated using the regression analysis. The results indicate that increased ratio of the number of constraints to the number of variables is directly correlated with increased likelihood of improving the quality of the solution. In conditions where the proposed approach has provided a solution better than the solution presented by the simple Light Robust approach, the mean value of the improvement accounts for about 9%. Gabrel, V., Murat, C., & Thiele, A. (2014). Recent advances in robust optimization: An overview. European journal of operational research, 235(3), 471-483.